I believe in Beauty. That it can save the world, change a mood, open a heart in an instant. It lives in the small moments. I judge beauty only by the the extent to which it makes me feel alive, connected and curious. Beauty is why I create photographs. When beauty calls, I respond with an image. Life constantly surprises me with the forms of beauty it offers, unexpectedly, continuously, quietly, like secret notes being passed from the world to my soul. These moment enter my heart and live forever. Right now I am in the San Francisco area enjoying some spectacular weather. Yesterday we took a day trip to the SF delta and had an inspiring day photographing the unusual landscape full of twisting, turning waterways, bridges and small towns. My memory cards were nearly full, and batteries almost empty. Just as we were pulling out of the parking lot to head home, this ship appeared on the far side of the river. It must have been there all along, but I did not see it before. It seemed to glow in the light as day turned to dusk. This was a stop the car moment, no doubt about it. As suddenly as it had appeared, it was gone. The light changed and the moment passed. The lesson I learned, don't hesitate. When something magical appears before your eyes, believe it is meant for you to capture and share if you can. This is my favorite image of the day. Good thing I had not put my camera away. This Tuesday, when I had so much work to do updating the website, writing new workshop descriptions, following up on critiques of past classes, the last thing I needed to do was spend the morning roaming around Boston in the fog. But I could not help myself. When I woke up and saw a whole lot of NOTHING out my kitchen window, I knew I had to get out there as soon as possible. I headed out into the fog and wandered until I came to edge of Charles River. This familiar spot seemed entirely new to me. The fog made the familiar strange and full of possibility. Once I got my settings right, that is remembered to over expose by 2 stops, (the camera thinks the scene is brighter than it is with fog or snow) and use manual focus (the camera can't focus on fog). I started to really enjoy what I was seeing and not seeing. There were stories everywhere I looked. So I had to stop, take a step back and ask myself, what story wants to be told today, about this moment this place, by me? What is the mood or feeling I am experiencing. What I love about fog, is the way it does not allow us to see everything clearly. It creates an experience of mystery for me. I hope I have captured that experience in this image for you. I’m curious… what story do you see? One of my biggest challenges is to be open to what shows up on any given day as the perfect experience for me to photograph. If I hope for a sunny day and rain comes, I try to see the reflections on the pavement, the patterns on the surfaces around me. If I plan to do some macro photography of flowers and the wind picks up, then I have to sift my attention to the movement of the colors and be happy with the dance. I have learned and relearned many times to find the gift in the unexpected, under appreciated, disruptions that get in the way of my plans. Leading photography walks in Boston this is especially true. I can't control the weather but I can control how I respond to it. We always have a great time and learn something new if we are flexible. Next time things are not going your way, imagine you can flip a switch inside your self that sifts your inner stance. Pretend for a moment that what is getting IN your way is actually helping you ON your way. See if you can photograph the disruption and appreciate what it helps you discover about your self and your world. This week we had an epic snow storm followed by bitter cold. So it would be wise to stay inside by the fire and sip sweet hot coco. But being photographers, the crisp, clear light and the possibility of something unnamed calls us all to come out. Out to explore, to see something fresh and feel really alive. 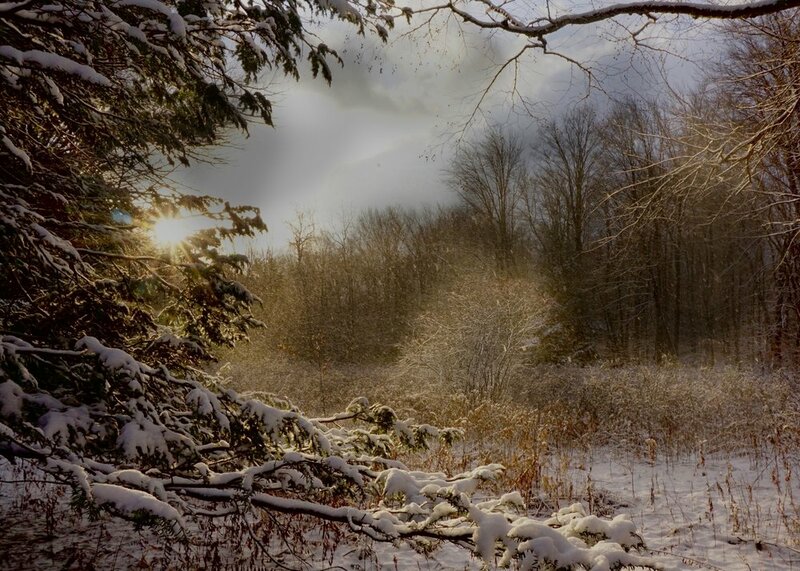 As I walked through the dark, silent woods near my childhood home, I suddenly stepped out into a clearing. And in that exact instant the sun broke through the clouds and lit up the scene. Time stood still, the cold did not matter and I felt a kind of excitement and joy flow through my heart. I resisted the temptation to start shooting. I just stood perfectly still, slowed my breath, and relaxed into being and seeing. The sun began to darken. I sensed the door was closing. Staying as still as possible I raised my camera and clicked. AS I walked home I realized, this is why I teach photography. I simply try to create the possibility that each of you will have more experiences of beauty and magic. It does not matter if you get the exposure right, or if your composition is perfect. What matters is the magic of the moment you fall in love with life. Have you ever felt really excited about your photography while you are in the middle of taking the photos only to feel disappointed when you get home and look at them? Sometimes we have an imagined image in our minds eye. We think we captured something special in the moment, but later it seems boring. It is not unusual to feel this way. I remember having the same feeling when we would shoot with film and send the roll of 36 away to be processed. The pack would come back in the mail and I would shuffle through the deck only to find two or three that were interesting. Now in a day shooting digital I might have 200 photos to look through and find two or three I feel satisfied with. But there is another step you can take if you really want to learn how to take better pictures. After you find 2 or 3 you are happy with, also find 2 or 3 that you are disappointed with. Now try to be specific about what you thought you captured and why this image is not really working. What would you do differently if you could do it over? Would you get closer? Shoot from a different angle? Change your depth of field? Imagining how to make it better will help you next time you are in a similar situation. So look at an image that disappoints you and imagine what it would take to delight you. Photography as a creative act. WALK SLOWLY ALONG A LINE OF TREES AT NIGHT. THEY MAKE GOOD COMPANY AND SHARE SECRETS IF YOU ARE LISTENING. As a photographer, you can use visual language to express the essence of an experience. Just like a poet who combines the verbs,adjectives and nouns in a certain way to evoke a knowing, and awareness of our inner experience of a moment, we use color, light, texture, combined (composed) in a particular way to express the experience we have and want to translate into a photograph. As said Robert Henri said in The Art Spirit, "Do not paint the night, paint the feeling of the night." And this is true with your photography, you do not photograph night, you photograph those things that evoke the feeling of the night. I did a series of trees at night and had the revelation that they have a whole other live at night, one we do not see. That is what I wanted to photograph. I stood there in the dark with them and wondered what was it like to BE a tree in the night. Only when I FELT a connection to the trees did I click the shutter. If you don't connect, don't click. Photography is a creative act of discovery, transformation and revelation when we are fully present to what we encounter. Summer is the perfect time to stay out after dark and discover how to capture the feeling of the night. Give it a try. I would love to see some of your night photos. I just returned from leading a three day Curious Soul Photo School Retreat. It was the Spring Retreat and I had lots of expectations. I expected there to be a beautiful sunrise each morningso we could capture soft dawn light, but we had fog and rain and snow. I expected to take the group on long, slow walks along the beach relaxing to the sound of the sea. Instead we had to scurry out and shoot what we could whenever there was a break in the wild gusting winds. Nothing went quite as I had planned. Instead, it was more wonderful than I could have imagined. The group created magical, mystical, moody images. We spent long hours by the fire looking at our photos quietly discussing our work as the storm raged outside. We relaxed deeply with guided meditations and enjoyed just being in the company of others who love photography, beauty and creativity. I plan to organized a Summer Retreat so will let you know when and where. For now, see if you can drop an expectation next time you take your camera out for a walk. You may be surprised what beauty comes your way when you least expect it. Wareham MA. Spring Curious Soul Retreat 2016 Walk on the Beach. You just never know what you will find while out for a walk. 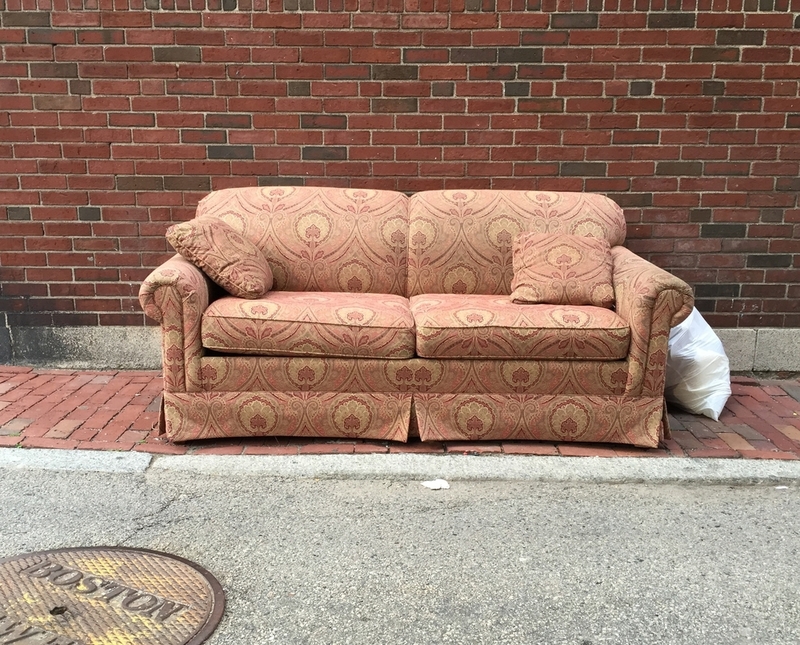 I started to notice how much furniture is abandoned out on the streets of Boston. With little effort you could furnish your apartment. But there is some strange sad feeling that comes up for me when I see furniture out on the street. I am not sure if it is because it feels like we are providing furniture for the homeless who sleep on park benches or under cardboard boxes in alleys and doorways. Or something else. I just know I always feel compelled to photograph these furnishings. If I figure out why I will let you know. You never know what you're going to see so have your camera ready.